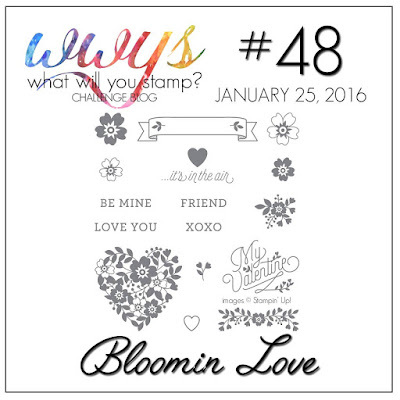 This week I decided to participate in the challenge at WWYS what will you stamp. It worked out great for me, I have that set, & had just done a demo. So...card was already done!! For the last club class we used the Bloomin' Love & Bloomin' Heart Thinlits Dies. I decided to make 2 different cards using the positive & the negative from the die. A little Love Blossom DSP behind the the cut out & you have a very easy card. Wow! Two beautiful cards!! I especially love the second one where you used the negative of the die cut. It is so striking! Thank you for playing along with us this week at What Will Tou Stamp! Love the card you submitted to WWYS. Thanks so much for playing. Love both of these -- hadn't thought to use the negative space! Brilliant! !